make me a sandwich…with your sandwich making skills | you seem nice. title = thoughts of a 15 year-old cousin. he’s ridiculous. it also reminds me of robby & corbin. because they would always tell me to make them a sandwich freshman year…and somewhat after that. i made the mistake of actually bringing them a sandwich one day…keyword = mistake. anywho. remember how i misplaced my ipod? well i totes found it! shyeah! so, like, a few days before it went missing my mom was showing me these shoes she bought. and i took them out and tried em on, but then we had to leave in a hurry, so i took the shoes off (why? because…they weren’t mine) and put my ipod down cause we were leaving. and now that i think back to this, it makes perfect sense. i ended up putting the ipod in the now empty shoebox. why? simple. safe keeping. i didn’t have time to go to my room, so i figured the shoebox would be a safe haven. problem was remembering. i’ve already been made fun of and received the really-you-found-your-ipod-in-an-empty-shoebox-what-the-hell-were-you-thinking look from everyone i’ve told this story to. even jeff svec, whose face i didn’t see, but i could sense via phone. so very very ashamed. it wasn’t THAT bad. i mean, my family still trusts me with kids. i wish i could say they were captivated by some crazy magician skills i have, but alas the fancy tv wins again. super cute, right? those are my cousins i babysat…babysitted…babywhatevered. 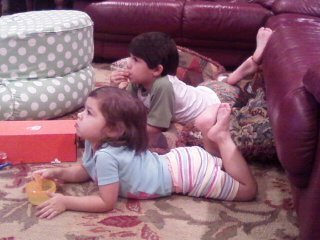 evan is 6 & elena is 2. they were watching some show about a colony of animated mice that i presume live in england based on their accents. one mouse is a ballerina and she has a gypsy mouse friend who sounds russian that was visiting. i think it’s called angelina ballerina? i don’t know, it was on the “sprout” channel. – telling them that i’m friends with santa and that i basically control what they get from him so they better be nice to each other and go to bed: 2.5 — and it totally didn’t work because 5 minutes later elena chunked her hardback fairytale book full of princess stories at evan at point blank. it hit his shins, he ran to a corner of his room and almost started crying. i think that was the worst thing that happened. she’s mean. oh, and evan told me the ONLY way he could go to sleep was to shoot and kill me with his invisible gun. they’re real cute. – letting them choose which books to read them before bed: 8 — they each picked the longest freakin book they could find and claimed that the stories were their “favorite,” psh. and yes, i read a story from the fairytale book. and now i’m looking for some sweeeet halloween crafts for the next time i babysit them. if you know me, even if it’s not by much, as in you read the about section & that’s it, you know that i LOOOVE christmas, so my recognition of any sort of non-christmas craftivity is one step closer to not being such a christmas freak. so any ideas would be fabtastic. please keep in mind that they’re 6 & 2 aaand no mummies allowed…had to restrain a corny joke there…baby steps. anyway, evan had nightmares about those so i really don’t want to be the one to traumatize him so that he has some crazy nightmares that psychologically damage him. like what happened to me when i was little, which is an entirely separate post in its own. horrible horrible horrible babysitting experience with two of my crazy aunts. more on them later. ALSO, austin trip in the works and i’m SUPER excited. seriously. oooh! and my first group presentation went really well. we had a nice mix of things. um, JESUS CAMP was mentioned and i wasn’t the one to include it! say whaaa? it was awesome. my part of the presentation was on staged war photography and propaganda films. specials thanks goes out to t.lil for that portion. i guess if you want to watch the vids you can? they’re kinda long, but totally worth it. fo realzies. so yeah! let me know if you’ve got any questions? comments? general interest? great, thanks! sorry this one is so long. mah bad. ← my family likes to make me mad. no, really. they enjoy it. You sat on some babies?! Jk. Thanks for the shoutout–oh man you’re coming to Austin?!?! WHENWHENWHEN!!!!! I cannot wait! Hey Alyssa… I’m catching up on my blog reading. And I’m thinking about Halloween crafts. You could always take some orange paper and cut it into pumpkin shapes and let them “make jack-o-lanterns”… just minus the pumpkins, gross gooey insides, and sharp knives. Yes? You could also get like paper bags from le grocery store (the handles are the main point here) and let them decorate their own candy bags. I’m assuming they’re going trick-or-treating? And yes, all of my ideas include markers, glue, and glitter. genevieve. this is why we’re friends. seriously. i miss you and your savvy crafting ways. and what are my top 3 favorite craft supplies (not including a hot glue gun) markers, glue, and glitter. it's like a magazine, but not. i mean, if you want an email telling you i've had a trying day, this is for you. you seem nice. · i think.